Forest Inventory Key System – Caslys Consulting Ltd. Accurate forest classification and inventory assessment are key components of effective management of forest ecosystems, for both conservation and economic purposes. The Forest Inventory Key System (FIKS) software development project was initiated by the British Columbia provincial government to improve calibration and resultant consistency when conducting forest inventory tasks. The FIKS application is an image key system, within a GIS environment, that is structured to maintain consistency between inventory mapping tasks conducted by various individuals with varying levels of forestry knowledge. The fundamental structure of the FIKS system includes a geospatial database that manages a series of selected image chips (small image tiles) with associated attribute data. It allows mapping professionals to build a large repository of image samples and then refer to these image chips, when needed, through querying and browsing tools. FIKS was developed as an add-in (or extension) within the Esri ArcGIS 10.1 ArcMap application. As such, users can work with images and forest inventory data in a familiar platform, while adding the ability to create image key libraries (or databases) that can be shared amongst groups for increased efficiency. 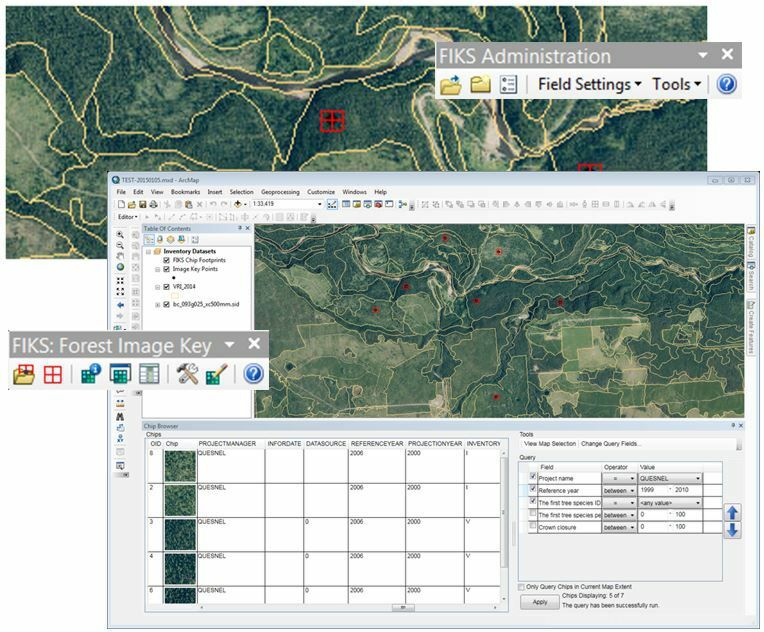 The development of the image key system now allows users to view forest inventory data in the form of ‘image chips’ and create image libraries (or databases) to help ensure consistency when conducting forest inventory mapping tasks. The FIKS product is currently implemented into inventory workflows by forestry professionals and is a useful training tool for assisting new inventory specialists.